If you are a raw vegan, you can enjoy this tart by freezing the crust instead of baking it. Either way, it's deeply delicious and perfect for the holidays! In VitaMix or food processor, pulse almonds, oats, vanilla, cinnamon, dates and 1/2 cup almond milk together to create tart crust. I have a video to demonstrate how to set up the crust here. Scoop crust mixture into a tart or pie pan. Using fingers, press and spread the dough out evenly, using water to wet your fingers as needed. Poke some holes around the base of the pie shell with a fork, and bake for 25 minutes on 350 degrees. If you are serving raw, place in freezer instead. In VitaMix, blend together cashews, 1/2 cup almond milk, maple syrup, coco powder, and espresso together until whipped into a cream. Poor cashew cream into pie shell and spread evenly. Top with fresh raspberries and keep cooled in refrigerator until ready to serve. This bright and colorful dish is so fast to put together, and tastes super rich and comforting. You can replace the Goat Cheese with Vegan Almond Cheese if you want a dairy-free version. In a medium sized pot, boil pasta until al dente. Drain, and poor pasta back into pot - keeping a little bit of the pasta water (just don't drain so much). Lower heat to medium/low and add cherry tomatoes, arugula, spinach, tomato sauce, goat cheese and all spices. Combine together well and serve! Khoreshteh Karafs is possibly one of my favorite Persian stews of all time. The base of this stew is celery, mint and lemon - a super flavorful and rich combination that makes my mouth water just thinking about it. It tastes SUPER Persian... So if you are just venturing into this region's cuisine, it might taste really exotic to you. Traditionally, we serve this stew with chicken, or stew meat. It's naturally packed with veggies, but it's normally cooked with a lot of olive oil. My version is completely vegan/vegetarian and oil-free, and tastes just as good as the real thing! I also used red kidney beans as some added protein, but I've tried this variation with white kidney beans or garbanzo beans, and it tastes just as yummy! In a stew pot, dry saute onions, adding small splashes of water or veggie stock as needed. Add in parsley, mint and celery, mix well. Add dried limes, lime juice, turmeric, salt, pepper and saffron. Combine well. Add water or veggie stock, beans, and cook on medium/low heat for 20 - 25 minutes until all flavors cook together. Serve over Basmati Rice or grain of choice. 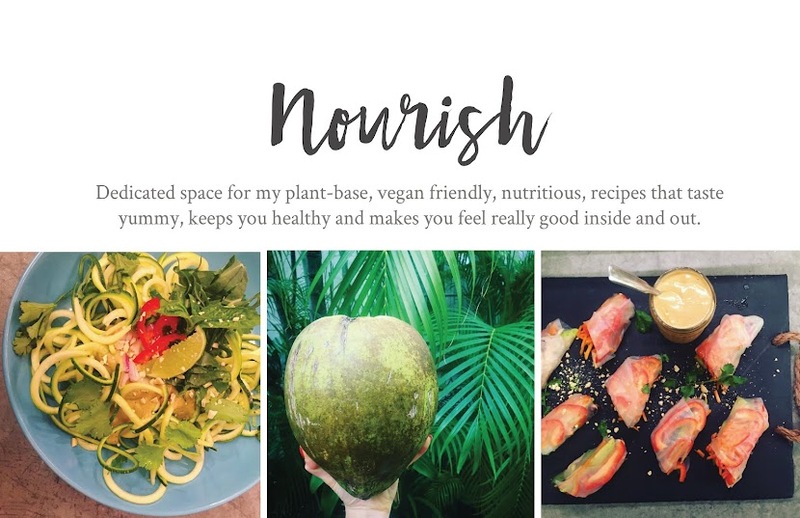 If you're eating a strictly plant-base, vegan diet and regularly exercising, it's important to make sure you're giving your body enough nutrients and protein. This breakfast bowl is a great way to pack in all those great SuperFoods at the start of your day! Because this breakfast bowl is packed with protein, antioxidants, Omega-3 and nutrients, it helps fight food cravings throughout your day. If you've never had Spaghetti Squash, don't let anyone try and tell you that it tastes anything like spaghetti. You will be extremely disappointed. The only resemblance Spaghetti Squash has to Spaghetti is it's shape - long and stringy. The texture, flavor, and smells are wildly different. So I like to celebrate this squashes flavors as it fits best with it's true self - instead of topping with tomato sauce to try and make it taste like something it's not. In this recipe, I used warm seasonings to bring out some of the sweetness in this squash, and topped with fresh parsley. A nice and simple veggie dish that looks pretty and tastes like yummy squash. Pre-heat oven to 375 degrees. Slice spaghetti squash in half, vertically, and remove seeds. Poor about 1/2 inch of water into an oven safe pan (glass pyrex dish), and place squash skin side down into pan. Place in oven and cook for 45 - 55 minutes, until fork easily pierces squash. Let squash cool. Meanwhile, mix together cumin, cinnamon, salt, garlic powder, maple syrup and olive oil. Using a fork, break up the squash and serve onto a plate. You will notice the squash breaks up into strings naturally just by scraping with your fork. Poor sauce over squash and top with fresh parsley. This dish is so ridiculously easy and simple to put together that I feel a little guilty posting a recipe for such effortless work. It took me longer to clean my dishes than it did to whip up this stir fry. The yummy sweet chili sauce really completes this dish. You can amp up this stir fry with even more veggies like peppers, spinach, mushrooms... You name it! But I decided to keep it super simple using only whatever I already had in the kitchen. Here's a little secret, I always keep my freezer stocked with flash frozen organic veggies, they are just as good for you as fresh veggies and contain the same nutrients and photochemicals. Of course, when I have extra time, I prefer using fresh. In a large skillet, dry saute onions. Add frozen broccoli and corn and saute until cooked, about 7 minutes. Meanwhile, whisk together almond butter, tamari, chili garlic sauce, rice wine vinegar, garlic powder, sesame oil, honey and water well. Set aside. Boil a pot of water and cook rice noodles as directed - be careful not to over cook or let sit for too long, they get mushy easily. Once rice noodles are just about cooked, drain and add to veggie stir fry. Poor dressing on top and lightly saute until combined. Told you it was easy. 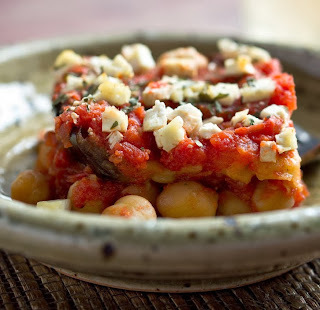 My dear friend Molly made this yummy recipe for Roasted Eggplant and Chickpeas with Cinnamon-Tinged Tomato Sauce and Feta from The New York Times. I had to recreate the recipe – vegan and oil-free of course. So voilá! Here you have it. Preheat oven to 450 degrees. Place eggplant slices onto nonstick cookie sheet and bake for 10 -13 minutes until lightly browned. Meanwhile, dry sauté onions in a medium sized sauce pan. Add the minced three cloves of garlic reserved for sauce, basil, cumin, cinnamon, turmeric and 1 tsp Herbs de Province. Mix well and add crushed tomatoes, maple syrup salt and pepper. Add in chickpeas and combine together with sauce. Let simmer. Note: If you would like to create this dish raw, you could use the red sauce in my Raw Living Lasagna recipe and add sprouted chickpeas. Meanwhile, you can prep the vegan almond cheese. In VitaMix or food processor, add almonds, lemon juice, salt, pepper and 3 cloves garlic. Pulse until all ingredients are combined. This ends up tasting like feta cheese! Once eggplant is cooked, let cool until you are ready to handle the slices. In a large pyrex dish, layer the chickpea tomato sauce onto bottom - reserve about a 1/4 cup of sauce for topping. Add one layer of mushrooms - use all 2 cups. Add layer with all your eggplant and top with remaining sauce. Using a fork, scrape out almond "cheese" from blender and arrange as the top layer. Sprinkle with 1 tsp Herbs de Province and optional grape tomatoes. Lower oven to 350 degrees and bake lasagna for 40 - 45 minutes - until bubbly and almond cheese is golden brown. Originally, I planed to serve this dish as a Thanksgiving side, but while I was assembling the vegetables and spices, it reminded me more of Hanukkah. The aromas from the cumin and caramelized carrots brought me back to my Grandma's dinner table. Either way, I say it's just a yummy dish for anytime of the year... But why not enjoy it during the holidays! PS, It tastes A LOT better than it looks. Preheat oven to 375 degrees. Toss carrots, maple syrup, olive oil and salt in a glass pyrex dish. Bake for 45 minutes. Meanwhile, in a VitaMix or high powered blender, blend together cashews, cilantro, garlic, lime juice, splash water and salt to create cilantro cream. Once carrots are roasted, poor cilantro cream on top once ready to serve. Note: I threw in some cubes of butternut squash left over from another dish I was putting together.